When you are looking for the perfect engagement and wedding rings for your special day let Gulf Coast Jewelry and Loan assist you. We have been servicing the Fort Myers and surrounding areas for many years and offer a large selection of diamond engagement and wedding rings and wedding bands. Your wedding day is one of the biggest days in your life. It is a day where you can symbolize your love with that someone special. Let Gulf Coast Jewelry and Loan help you choose the perfect wedding rings for your perfect mate to make your wedding day extra special. At Gulf Coast Jewelry and Loan you can browse through our large selection of dazzling diamond engagement rings, wedding rings and classic wedding bands. We carry a wide variety of styles and settings to fit any taste. At Gulf Coast Jewelry and Loan we can help you create and customize your own unique and personal wedding rings. 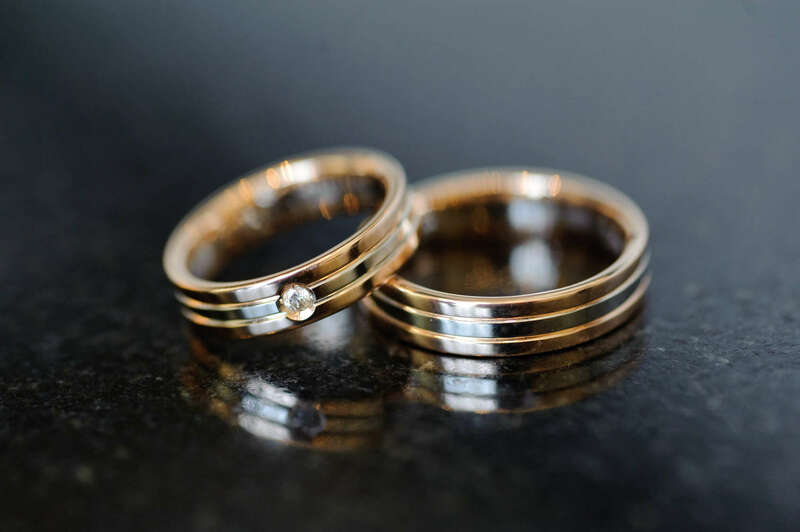 From timeless yellow or white gold to silver or titanium, you will find the quality and style that will be perfect when symbolizing your love on your special wedding day. Choose your metal and style– Your wedding rings are something that you and your mate will buy together and wear forever. Take your time and talk about what you want. There are many choices of metal to choose from. Do you want white or gold metal? Do you want it to match your yellow gold jewelry or the white metal of his watch? Budget– From plain gold bands to diamonds and precious metals like platinum, the costs of wedding bands vary. Are you looking for traditional bands or are you planning on creating special customized bands with engraving? Make time– Don’t wait until the last minute. Take your time, plan ahead and consider all your options. Custom sets and engraving take additional time. Think practical– There is no point in buying a wedding ring that doesn’t feel right on your finger or one that you will have to remove during certain times of your day. Remember, you will be wearing your wedding ring everyday. Choose one that fits right and one that will not cause distractions to your daily lifestyle.